Sweetman Illustrations: Yet Even More Face Painting! 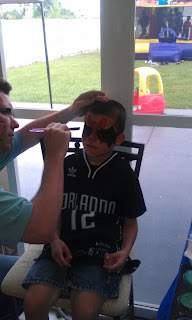 This will be the last group of face painting pictures. Like I said before, the theme was Toy Story, which explains the Woody and Jessie faces. It does not explain the bat, however. For some reason, the birthday boy wanted Batman, posted earlier, and this kid wanted a bat. I made it up on the spot and he seemed to really like it.